Sasha Martin tells us on page one that this is not the book she meant to write. Life from Scratch, a memoir of food, family, and forgiveness (National Geographic Society, Washington, D.C. 2015) is a beautifully written exploration of love, loss and redemption, but it started as a stunt memoir based on her popular blog Globaltableadventure.com. Between 2010 and 2013, Sasha Martin, an award-winning food writer, cooked meals from all 195 counties in the world for her picky-eater husband and toddler daughter in Tulsa, Oklahoma. Her engaging prose, coupled with interesting and accessible recipes, earned her a loyal following and press, including an interview with Rick Steves on NPR. More than 650 recipes are searchable on Sasha Martin’s website. But rather than expanding her popular blog into something familiar in book length for her dedicated followers, Life from Scratch details Martin’s efforts to make sense of a chaotic and confusing childhood and her struggle to build an adult life of meaning and connection through cooking. From her perspective as a new mother, Martin tells the story of her own free-spirited young single mother in the 1970s, who connected her and her brother with their larger-than-life, immigrant relatives and with the exciting culinary world of Boston’s North End. With empathy she describes her mother’s creativity in the face of poverty (doesn’t everyone drink cranberry juice on their cereal? ), the events that landed the two siblings in foster care, and finally the family friends who rescued them from the court system. From Boston, Sasha Martin lived in Atlanta, Paris, and Luxembourg before she graduated from high school, never understanding why she’d been taken from her mother in the first place. At one point she writes, “There are mysteries buried in the recesses of every kitchen – every crumb kicked under the floorboard is a hidden memory.” And as she gently but persistently pokes at the crumbs of memory in her life we come to realize how difficult it is for children to process the lies and half-truths we invent for their protection. Aside from the compelling personal narrative and the beautiful writing, it’s the family-tested recipes that have earned this memoir a permanent place in this reader’s library. Martin includes 29 home-grown favorites along with more exotic fare, but always in a way that enhances the story. There are her mother’s family recipe for Hungarian crepes and Chicken Paprika. There’s artisan French bread from her days in Paris, and Torta di Riso from her reunion with her mother in Boston. Graduation from cooking school is marked with directions for making the perfect omelet (it took her 75 tries to get it right). Sasha Martin’s Culinary Institute of America (CIA) training takes her to Tulsa, Oklahoma to work for a company that invents processed foods. Once through her internship and launched in life, she embarks on her world cooking adventure. Rather than source exotic ingredients on the internet, she forages for them in her middle-American city, finding communities and cultures that were hiding in plain sight. And because she’s managing a household and a toddler, Martin uses her CIA skills to simplify her recipes and make them accessible to home cooks. I realized, in reading these recipes, that cooking with local ingredients doesn’t mean you’re limited to local cuisine. And I’m looking forward to making two kinds of chicken stew, Kabeli Palau (Afghanistan) or Muamba de Galinha (Angola), though I’ll skip the baton de manioc made from cassava root, which if prepared inexpertly can give you cyanide poisoning according to Martin. Sasha Martin is a gifted writer with the ability to make the most intimidating recipes accessible to ordinary cooks. She also faces the world with an open mind and boundless curiosity. Like many of us in America where so few people let roots grow in one place, she craves community but has a hard time making connections in her adopted Oklahoma home. As she brings her global cooking adventure to a close, she decides to create a world-food event, in which local chefs and home cooks adopt recipes from all the countries in the world, bringing the results to a global potluck to support the local food pantry. She is amazed to meet Tulsa families from Ethiopia, China, Australia, Nigeria, and France. Old friends, new friends, and family come together to build a global table. I can only imagine that Sasha Martin – and Tulsa – will never be the same- with the realization that each bite can be a flash of the past and the present. 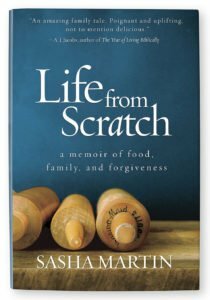 [Editor’s Note (FWB): In addition to Sasha Martin’s Life from Scratch, a memoir of food, family, and forgiveness, highly recommended (especially for summertime reading) are three other “food related” memoirs: Kirsten Kimball’s The Dirty Life, A Memoir of Farming, Food, and Love, Julene Bair’s The Ogallala Road, A Memoir of Love and Reckoning and Novella Carpenter’s Farm City: The Education of an Urban Farmer.